What Is The Use Of Fiber Optics In Internet Technology? Home/News/What Is The Use Of Fiber Optics In Internet Technology? Internet technology has been dramatically evolving for the better, from the early days of dial-up to today’s Fibernet. Picture a day where you don’t need Internet technical assistance due to minor Internet downtime; you can stream videos without buffering, and you can enjoy equal upload-download speeds. Would you believe us if we said that this day has come thanks to fiber Internet? Today, optical fiber cable has allowed the fastest connection speeds in history. Although the technology is relatively new in the United States, it has plenty of strengths and benefits to simplify communication and strengthen internet connections. In the United States, a well-known mode of data transmission is copper cables. This is why you get broadband connected with a fixed telephone line connection from the ISP. Although there’ve been several improvements from DSL to VDSL2+, there are quite a few limitations with copper cables, ranging from bandwidth and accuracy to latency and disruption. Copper cables have been traditionally used to transmit a small amount of data, due to the fact that they can only transmit voice. However, optical fiber cables are only used for data transmissions, since they’re made of glass and are much thinner than a strand of hair. This guarantees that there’s minimal interference, less breakage, and much faster transmission. Optical fiber cables also ensure greater reliability and less error, which provides a higher speed Internet. All in all, optical fiber cables are the quickest way to carry ample bandwidth signals in a GHz range. Therefore, the launch of fiber optical technology has introduced a higher bandwidth providing fast Internet speeds. 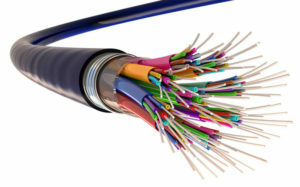 What’s the Role of Fiber Optics In Internet Connections? The top benefit of fiber optic Internet is that it runs at the speed of light. Because Fibernet offers symmetric uploads and download speeds, you can enjoy incredibly fast Internet for several uses. For example, if you work online and use the Internet for business, then slow Internet connections can affect performance and accuracy. Additionally, people today are more likely to upload content, work online, and download content at their own pleasure. Thus, Fibernet can meet those demands. With fiber internet comes greater bandwidth. What this means is that you could stream HD movies and content, access the internet across several different devices, upload to the cloud, and enjoy data within your monthly budget as you please. Some factors for slower bandwidth include buffering videos, pixelated content, slow page load, and the inability to download or access information. From online media and gaming to ERP and SaaS (software-as-a-service), there are several reasons to need a high-speed Internet connection. With fiber optics, you can easily tackle many Internet problems so that there are minimal disturbances and consistent Internet connections. Additionally, fiber optics has an incredible signal strength that’s highly durable, unlike copper cables. Can Optical Fiber Improve Life? Because the price gap between fiber optic cables and copper cables is slowly decreasing, more people are beginning to understand its cost efficiency and performance. As more and more people enjoy undisturbed Internet, they’re also experiencing little to no maintenance needed on a fiber cable network. Despite its benefits, the only limitation on optical fiber is its restrictions across cities. In time, fiber internet will become increasingly utilized across the United States. With social media, gaming, VoIP, VoD, video chats, and many more uses of the Internet encompassing our lives, fiber optic cables are much needed now more than ever. Upgrading to fiber Internet not only grants faster speeds across multiple devices, but larger bandwidth Internet connections. At NCTC Fiber, we ensure that fiber optic cables will offer you a faster, stronger, and more secure Internet connection. To become a certified fiber optics installer, enroll today.